The main characteristics common to Third World countries are a high level of debt, an income distribution concentrated to the top 1% of the population, and an economy based on export of raw materials and import of manufactured products. (Source: Swans Commentary). By those yardsticks the United States is slowly slouching toward Third World status. 46 of 50 states are on the verge of bankruptcy, our cities are going dark at night, our asphalt roads are being returned to nature and sharp budget cuts are leaving our students without teachers and supplies, or even a full-time education. Just this month, in shocking scenes of mass desperation, 30,000 people showed up to apply for public housing in East Point, Georgia for 455 available vouchers. The despair and chaos suggested a Third World nation, not the United States - but it was the United States. Perhaps we shouldn't be so surprised. After all one out of every eight American adults and one out of four children now survive on government food stamps. And according to the US Department of Agriculture, 50 million Americans were unable to buy enough food to remain healthy at some point last year. These are shameful numbers for the world's richest nation. But none of this should be a mystery. Since 1975, practically all the gains in household income have gone to the top 20% of households. Whilst the conservative right keeps its voters hypnotized with the latest shell game involving God, Guns and Gays, the ordinary citizen has had his wallet pilfered or her purse snatched, over and over. Of the $1.7 trillion in tax cuts taxpayers received through 2008, high-income households received by far the largest - not only in amount but also as a percentage of income - which dramatically shifted the concentration of after-tax income toward the top. The income gap is expanding now not because the middle class is losing income, but because the incomes of the wealthiest are skyrocketing. 'If income growth had been shared equally among all income groups, the families at the bottom would have $6,000 per year more than they do now, and the middle would have $13,000 more,' says the Center on Budget and Policy Priorities this month. It's a fact universally acknowledged that the most dramatic wealth gap in American history literally exploded during the eight years of the George W Bush administration. 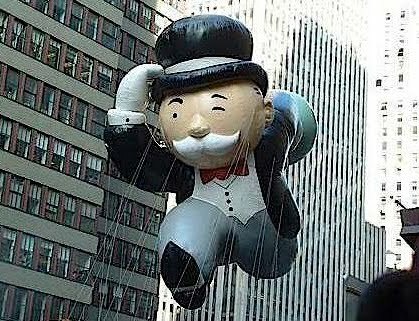 Now the top 1% owns a third of Americas wealth and 50% of its bonds. In fact, the gap between the top 1% and everyone else hasn't been this bad since the Roaring Twenties. Meanwhile the real average earnings for middle class Americans have not increased in 50 years. Republican tax cuts have significantly increased the wealth gap, of course. Income tax just keeps getting lower and lower for the rich. It's a champagne and caviar party that never ends, if you're one of the elite few with a golden ticket, that is. If you aren't in the top 1% of America's earners, you're pretty much screwed. If the 80% of American households are unable to take back the power that they have gradually conceded, then it will continue like this for the vast majority, who have become the financial minority. Voting for your prejudices and against your pocket book, just like all those broken asphalt roads, is leading us nowhere fast.